What does it mean to be called by God? Why and how does God call human beings? If God is calling you, what should you do? "No one can come to Me," Jesus said, "unless the Father who sent Me draws him" (John 6:44). This statement from the founder of Christianity knocks in the head the most widely believed error in today's so-called Christian churches — that God is desperately trying, right now, to save the world! Religionists will tell you that a great battle is taking place, this very minute, between God and the devil. On the one hand God, through the hopelessly confused and conflicting myriad of Christian denominations, is trying to get people to "give their hearts to Him" or be "born again" or join some church so that they can be "saved" and whisked off to heaven when they die. On the other hand, the devil is working — and quite effectively, too — to keep people from hearing about and submitting to Jesus Christ, trying to deceive and trap people into rejecting God so that they end up burning forever in hell fire. Nothing could be further from the truth! The plain teaching of your Bible tells a much different — and much more positive story. The plain truth is that God is not trying to save the whole world now. Adam and Eve, the first humans, chose to decide for themselves what was right and what was wrong, instead of abiding by God's definitions and living God's way of life. Deceived by Satan, the progenitors of all the human race rejected God's rule over them and chose to go their own — actually Satan's — way. You can read about it in the first three chapters of Genesis. And God allowed them to decide which way they would go. He allowed them to choose to sin. But God thereafter barred Adam and Eve and all succeeding generations from open access to Him, including open access to the tree of life and His Holy Spirit (Gen. 3:22-24). For 6,000 years now, man has been going his own way, cut off from God. And he has reaped the awful results — the sick, decaying, evil world you live in. Notice this statement from the almighty God who holds all power and all destiny in His hands: "Behold, the Lord's hand is not shortened, that it cannot save; nor His ear heavy, that it cannot hear. But your iniquities have separated you from your God; and your sins have hidden His face from you, so that He will not hear" (Isa. 59:1-2). There is no battle between God and Satan. God is not trying to save the world now. He has allotted 6,000 years of a 7,000-year plan for man to go the way that leads to death (Prov. 14:12) and learn that obeying God is the only way to happiness. God has reserved to Himself the right to work with selected individuals now, during this 6,000-year period, to perform special tasks. As Jesus said, "No one can come to Me unless the Father who sent Me draws him" (John 6:44). God is calling some today, for a special purpose. And He reveals Himself and His truth to those He calls. How? Notice what the apostle Paul said: "But as it is written: 'Eye has not seen, nor ear heard, nor have entered into the heart of man the things which God has prepared for those who love Him.' But God has revealed them to us through His Spirit" (I Cor. 2:9-10). God opens a person's mind with the power of His Holy Spirit. When one answers God's call through repentance and baptism, God actually places His Spirit within the person's mind. God's Spirit gives a human being the mind and will of God, along with the power to obey God. The person can then, for the first time, really understand spiritual knowledge. He is completely different from any person without God's Spirit, and functions differently. He becomes an actual begotten child of God: "For as many as are led by the Spirit of God, these are the sons of God" (Rom. 8:14). Notice another statement from Paul: "The carnal mind [the mind without God's Spirit] is enmity against God; for it is not subject to the law of God, nor indeed can be. So then, those who are in the flesh cannot please God. But you are not in the flesh but in the Spirit, if indeed the Spirit of God dwells in you. Now if anyone does not have the Spirit of Christ, he is not His" (verses 7-9). Get that last sentence. It is what separates true Christians from those who are not Christians at all: "Now if anyone does not have the Spirit of Christ, he is not His"! Unless God personally, directly, miraculously intervenes in a person's life and opens that person's mind — unless that person submits his life to God and receives God's Holy Spirit — unless that person has God's Spirit leading him, motivating him, guiding his thoughts and actions, he is not a true Christian! To know God and be a true Christian now — to be qualifying for salvation — God must call you and make you part of His Work. It's not something you can choose to do, no matter how much you may want to. God must make the choice to call you and begin working with you. God's Word clearly defines the commission — the Work — that God's called people are to be carrying out at this time. Notice Matthew 24. Christ was describing the signs that would precede His Second Coming to restore God's government to the earth. In verse 14, He predicted what would happen just before the end of this age: "And this gospel of the kingdom will be preached in all the world as a witness to all the nations, and then the end will come." God's called people in this age are given the commission of carrying Christ's Gospel message — the good news of the world tomorrow — to all the world. That is the message you read about in this magazine. That is the Work every true Christian will be part of. The other main part of what God's people are called to do is to grow in godly character — come to think and act just as God does. God's begotten children are to be preparing to be married to Christ at His return (Rev. 19:7). God's Church is actually being judged by God now, in preparation for birth into God's very Family at Christ's return (I Pet. 4:17). Is it any wonder that Paul says true Christians are called with a "holy calling" (II Tim. 1:9), or that he tells God's called people to "walk worthy of the vocation wherewith ye are called" (Eph. 4:1, AV)? How does a called and converted person "walk worthy of the vocation"? Peter says, "As He who called you is holy, you also be holy in all your conduct" (I Pet. 1:15). Peter later noted that true Christians should live as Jesus Christ lived (I Pet. 2:21-22). Have you truly been called by God? Is God calling you now — leading you by His Holy Spirit? How would you know? If you are being called by God, you will come to have a deep, abiding belief that God exists, and that He is in charge of everything that goes on in this physical realm: "He who comes to God must believe that He is, and that He is a rewarder of those who diligently seek Him" (Heb. 11:6). If you are being called by God you will believe that the Bible is God's Word — God's instruction book for man — that every word of the Bible is true. What's more, with the Holy Spirit guiding your mind, you will begin to actually understand what you read in the Bible. You will begin to actually want to study the Bible, striving to dig out every gem of truth it has to offer (II Tim. 3:16-17). You will desire a closer relationship with the great God who created you and who is revealing His truth to you. This type of relationship is fostered through intensive Bible study and fervent prayer. You will understand as you never have before the importance of prayer and how to pray, and you will want to do so regularly. "Draw near to God," writes James, "and He will draw near to you" (Jas. 4:8). If God's Spirit is actually leading you, you will begin to feel a sense of purpose in your life, perhaps for the first time. You will develop an inner sense of urgency about the times we live in, an excitement over the truth you are coming to understand and an expectation about what is ahead. And yet, you will feel an inner peace and calm unlike any other you have ever known. This is the "peace of God, which surpasses all understanding" (Phil. 4:7), which God's Spirit offers. You will come to understand God's true doctrines, realizing that they are far different from what you have probably been taught or heard all your life. The truths about heaven and hell, about the doctrine of the immortal soul, about holidays such as Christmas and Easter, about God's Sabbath, will surprise and move you. You will come to know deeply that God's law is in force today. Christ Himself said: "Do not think that I came to destroy the Law or the Prophets. I did not come to destroy but to fulfill" (Matt. 5:17). You will realize the importance of what happened in the Garden of Eden — understand the events that occurred before man's appearance on earth — begin to get a glimpse of the incredible human potential. If God is working in your life, you will start to see how you, just like Adam and Eve, have been taking of the tree of the knowledge of good and evil — how, all your life, you have been following your way — the way that leads to death (Prov. 16:25) — instead of God's way. You will come to know the meaning of sin, and you will be broken up inside because you yourself have sinned, bringing the death penalty on yourself and requiring the death of Jesus Christ to pay that penalty in your stead (Rom. 3:23, 6:23, 5:8). You will come to see how evil this world really is, and you will want to detach yourself from it — have no part in its hellish ways. If God is calling you, you will be ready to do the hardest thing any human can do — admit you are wrong. This is the beginning of real repentance. You will want to change your life — stop following Satan's way and do what God tells you to do, no matter what. You will begin to have the power to say no to the wrong urges, habits, desires and attitudes that have always propelled the things you did. Your life overall — your main motivation and disposition — will be characterized by the word give rather than the word get. You will want to do all you can to serve and help this wretched world, and a true Christian achieves this, first and foremost, by doing God's Work — sharing the precious knowledge of God's truth with the rest of mankind. You will put your whole heart into God's Work. You will completely dedicate yourself to having a part in warning the world of the dramatic events to occur just before the close of this age, and of the fantastic, beautiful world that awaits just beyond the horizon. You will be thrilled to have a part in telling the world there is a better tomorrow — that God cares and is about to act. If you are being called by God, you will soon realize that nothing else matters. If, after careful evaluation, you feel that God is calling you, what should you do? The Worldwide Church of God has ministers throughout the United States and around the world. These men, fully trained in Bible knowledge by Ambassador College, are completely qualified to answer any questions you may have about God, the Bible, Christianity, conversion or personal problems in your life. 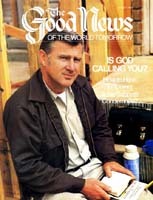 The fact that you are reading and understanding this magazine is a sign that God may be calling you! Perhaps you have been reading this Work's publications for years, but have hesitated to look deeper into the knowledge we offer. Perhaps you have been confused or apprehensive about what accepting this knowledge might require in your life. But know this: God holds you responsible for what you know. As James wrote, "To him who knows to do good and does not do it, to him it is sin" (Jas. 4:17). If you have read this far and understood what this article has been saying, perhaps it is time to do something about it. Our ministers would be happy to talk with you about repentance, baptism or other subjects. There is absolutely no cost or obligation on your part in asking for ministerial counsel. If you would like to talk to one of our men, please contact us.